On the facade of the church of San Nicolas de Corbetta was painted a beautiful picture of the Madonna, seated on his throne with the Child in her lap. The April 17, 1555 the Child Jesus left the table and went to the plaza to play with the three children. The Madonna, surprised by the escape of the Child, also down to the square, to reprimand him, as a good mother. Corbetta is an elegant city, marked by the presence of many patrician villas, a dozen kilometers from Milan on the way to Vigevano. The April 17, 1555, the first Thursday after Easter of Resurrection, two hours depues noon, three children playing ball on the square in front of the church. One of the three, about ten years, was deaf and known as such throughout the city. Had the name of Antonio Della Torre, nicknamed Novello. Novello da suddenly a cry of surprise, and exclaimed, "The Virgin and Child." His companions, surprised by the sudden silent words, look for where it says, and see the figure of the Child Jesus in the form of a living child, which left her mother's lap, and fell to the ground, placing itself in a place to watch the children play. Seeing this, the Virgin Mother leaves his seat, rebukes the Divine Infant and return to the place where they had always been. The boys, taken by surprise, left the game and run to tell their parents, and the news spread instantly in the small town. The wonderful story, told as innocent children, was confirmed by the miracle of sudden healing of the deaf mute, and won the surprise and excitement throughout the country. All the people left work and headed to church to worship and sing the Litany in honor of the Blessed Virgin. This news may be considered the result of pure imagination, if it had not been supported by historical data. Three children playing in the square has a name: Cesare dello stampino, Antonio della Torre and his brother Juan Angel, ten years, deaf by birth, familiarly known as Navello, and the evidence is irrefutable: Navelli speaks after miracle whereas before it was dumb and deaf. This is the first miracle of a long series: within 80 days after the onset of a cinquentena counted. 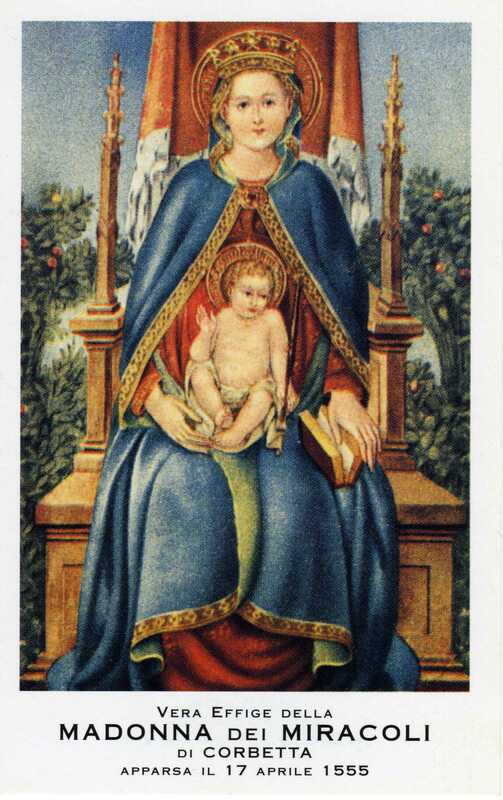 Serafino Barchetta April 20, Beltramina Marcotte 21, 22 Pietro da Siena, Tommaso Ferrario and many others, so that the Virgin of Corbetta took the name of Our Lady of Miracles: From the first name is remembered. The shrine was built where previously was the oratory of San Nicolas of the twelfth century and where the fresco of the Madonna with Child was painted in 1475 by Gregorio Zavattari. The year after the onset, 1556, the capitol of the Canons, to accommodate the many pilgrims and to protect the box exposed to the weather, decided to build a shrine, appointing a committee to continue the work, the work will be slow in those calamitous years by the presence, among the many difficulties of a terrible plague, and numerous wars of invasion. Already in 1560 the Roman Curia begins the process for examining the authenticity of the apparition, and in 1562, at the request of the young Cardinal San Carlo Borromeo, Pope Pius IV granted a plenary indulgence, as Jubilee. Only at the end of 1700 the upper sanctuary was full, but its present appearance the acquire with the work done in 1800 and 1900. Despite the variety of styles of architecture, the church has a harmonious beauty. San Antonio, by the painter Stefano Montalto, the wooden crucifix of 1600, and the frescoes by Giuseppe Reina and John Perabo, representing the miracle. Above the central altar, in an elevated position, is the miracle painting, a work of refined elegance, inspired by models of Tuscany 300 of which he is the author of Zavatteri Gregorio. After extensive and costly renovations, the sanctuary was consecrated in 1954, Mariano year. Running in 1955 the fourth centenary of the apparition, the capitol of St. Peter in the Vatican granted the coronation of the image of the Virgin and Child. The precious crowns are placed on the head of the Virgin and Child Jesus on April 17 of that year, by the Archbishop of Milan, Cardinal Giovanni Battista Montini, the future Pope Paul VI. The museum was founded in the middle of the nineteenth century by the rector, Carlo Chierichetti, historian of the sanctuary, which was concerned with rearranging and restoring antiques in it. The museum was conceived as a pilgrimage route that illustrates the history of religion in Corbetta and his shrine, considered the miraculous apparition of the Virgin in 1555. The objects were displayed in the faculty rooms above the sanctuary of Annex XVII century. The museum consists of paintings of sacred art and precious objects donated as votive offerings, gathered in the chapel of Blessings in the second courtyard and cloister. At the top, the "Bull of forgiveness" of Pope Pius IV (1562) and granting a plenary indulgence to those who visit the shrine of Corbetta Thursday after Easter is also presented. There is also preserved a number of church furniture, including several altarpieces of gold and precious stones, silk fabrics, for the high altar of the lower church of San Nicolas or devotional chapels, liturgical pottery in gold and silver. A special section also includes a series of liturgical vestments, albs, stoles and coats the eighteenth and nineteenth centuries. There is also a beautiful chalice donated by Cardinal Alfredo Ildefonso Schuster during his pastoral visit in 1935. In the section of the museum called "Rooms of San Carlo" is a series of traditionally preserved as relics belonging to San Carlo Borromeo , including a bed of XVI century, which once stood in the village Fristiani Mereghetti Maggi, where the saint had asleep in his Pastoral Visit of 1580 and a miter, a layer of cardinal and some autographs, exposed along with other leaders of the Milanese Church, who visited the sanctuary as Alfredo Ildefonso Schuster, or Giovanni Battista Montini. One room of the museum is dedicated to the relics preserved in the sanctuary, donated through the centuries by individuals and religious institutions. Scheduled and officially registered in the eighteenth century, are kept in reliquaries of various ages and invoices. They are: a fragment of hair Agolanti Beata Clara, a fragment of the robe of the Virgin, Santa Margarita bone, a bone of St. Francis de Sales, a fragment of the robe of St. Ambrose, a fragment of the veil Madonna di Loreto, Santa Laura hair, dressed as a fragment of San Jose, San Donato bones, Santa Teresa, St. Maurice, Saint Lucia, Saint Savina, San Bassiano, San Luigi Gonzaga, San Fermo, San Prudenzio, San Urban Santa Colomba, Santa Maria Egiziaca, powdered bones of St. Nicholas of Bari, San Antonio Abad, San Carlo Borromeo. Besides these a clove of San Mona (donated by Capitol Milan Cathedral in 1652), a tooth St. Apollonia, a tibia and a femur of the eleven thousand virgins companions of St. Ursula is preserved. equested a hearing to tell the wonders that were performed in Corbetta, and the influx of pilgrims to venerate the Blessed Virgin. Got a plenary indulgence for the day of the Nativity of Mary, 1560. The same grace also scored San Carlo the following year, and for the feast of the Assumption for several years. Then the treasure of the plenary indulgence was extended to all other celebrations of Maria SS. It differs from the altar of the particular privilege of the Miraculous Virgin, which was granted for each day of the year and for each celebration of the Mass applied to the deceased. All these favors were surrounded by an even larger and is the privilege of the plenary indulgence in the form of Jubilee, a benefit each year in perpetuity, the first Thursday after Easter, to be called "the Day of Atonement." The Pope Pius IV, in a brief "Unigeniti Filii Dei" agreed the great indulgence granted in the form of Jubilee, to the memory of the appearance and the miracles that followed, and called Our Lady of Miracles. O Vergine santissima, operatrice amorosa di tanti miracoli, che dall'immagine dipinta sulla porta della chiesa, scendesti mirabilmente nella piazza per riprendere il tuo Bambino, dopo aver sorriso ai giochi di alcuni fanciulli e reso l'udito e la parola ad uno di essi, scendi ancora col tuo gran cuore in mezzo alle nostre popolazioni, alle nostre case, ai nostri stabilimenti, alle nostre campagne. Ma soprattutto, o Vergine dei miracoli, ti preghiamo di convertire noi per primi, e poi tante anime lontane e a noi care, che sono divenute sorde e mute alla voce del Signore. + ENRICO ASSI pro Vic. Gen.